Bottom Line: A lively and engaging extra añejo with surprising flexibility and agave freshness. 93 • Case Study Tennessee Straight Bourbon Whiskey 45.2% (USA) $69.99. 91 • El Gran Jubileo Blanco Tequila 40% (Mexico) $49.99. 93 • El Gran Jubileo Reposado Tequila 40% (Mexico) $59.99. 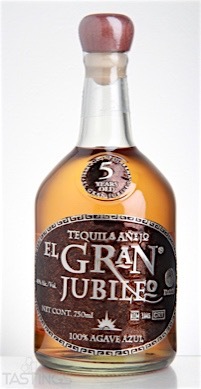 95 • El Gran Jubileo 5 Year Extra Añejo Tequila 40% (Mexico) $89.99. El Gran Jubileo 5 Year Extra Añejo Tequila rating was calculated by tastings.com to be 95 points out of 100 on 6/20/2016. Please note that MSRP may have changed since the date of our review.